German Figure Display Rack w/ Lighted Vader Bust: Here are some shots of a pretty unique German action figure display. 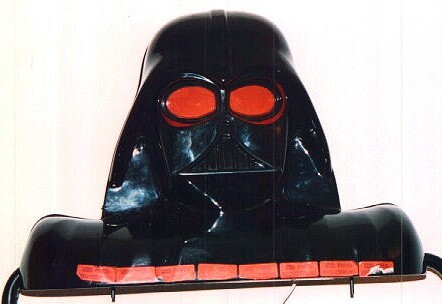 As you can see, it consists of a lower wire rack portion, used to hang carded figures, and an upper portion, consisting of a molded plastic Darth Vader bust with red light-up eyes. According to Michael, this display appeared in stores in the early-80s. Its interesting to note that its design is very similar to a Spanish display of around the same time. Here's a close-up of the head. Apparently, those rectangular orange stickers served to notify consumers of reduced prices on Star Wars figures.